In early January every year music lovers from around the world gather in the picturesque coastal city of Cartagena, Colombia, for the annual International Music Festival. For just over a week, renowned musicians from across the globe fill the city’s plazas, churches and theatres with music. 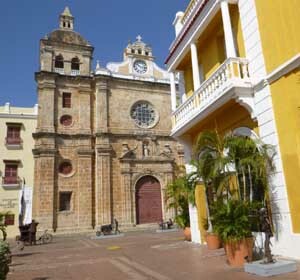 The Cartagena Music Festival was co-founded by Italian harpist Victor Salvi and his Colombian wife to introduce young Colombians to the world of classical music. And it was Julia Salvi, who, upon the death of her husband last year, became the driving force of the Festival. This year the Festival celebrates its 10th anniversary in the midst of real joy-- the talk of a cease-fire between the forces of the Colombian government and left-wing Farc rebels, and hope that soon a peace treaty will be signed ending five-decades of armed conflict. The theme of the 2016 Festival was that of a musical bridge between Europe and the Americas, exploring the influences each culture had on the other. The concerts therefore included works by western composers played by western artists such as the Orpheus Chamber Orchestra (the New York based group which plays without a conductor), violinist/conductor Maxim Vengerov, violinist Anne Akiko Meyers and Italian conductor Rinaldo Alessandrini among others playing Bach and Beethoven. Many Latin American musicians and composers were also included, for instance, the famous Argentinian tango composer and bandoneon player, Astor Piazzola, and the current master bandoneon player Rodolfo Mederos, who thus described his instrument: "It is my best friend and is always with me. It cries when I leave it alone. It understands me and knows why I am as I am. It is a part of me." Performances took place in a number of old theatres, churches and in the colourful squares of the Old City. 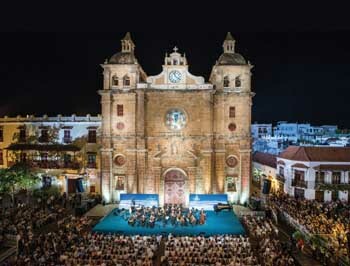 Concerts were held in the Puerto de Cartagena, in the Plaza San Pedro, in the flower-bedecked inner court of the lovely Convento Carro de la Popa perched up on the highest hill overlooking the port and the old city walls, in the tiered Teatro Adolfo Mejia, and in some of the churches of the old barrios outside the historic walled city. An interesting venue was the Chapel of the Sofitel Legend Santa Clara Hotel, where Maria Silva, the heroine of Gabriel Garcia Marquez’ novel Love and Other Demons was kept prisoner. A concert of Latin American music paid homage to Blas Emilio Atchortua, one of the first Colombian composers to experiment with and use electroacoustic media in his music. The group Colectivo Colombia played Atchortua’s Cuarteto de cuerrdas No.4 Op.87 and then continued with works from the Caribbean coast of Colombia by the saxophonist and flutist Antonio Arnedo. The high point of the evening for me were two Colombian songs performed by Toto la Momposina y sus Tambores, said to be Colombia’s most famous export, El Pescador by Jose Barros, the prodigious composer of cumbia dance style music and Prende La Vela by Lucho Bermudez, the most famous 20th century Colombian composer and performer of folkloric rhythms. Toto’s music is a wonderful fusion of African slave, indigenous Indian and Spanish rhythms accompanied by a collection of hand percussion instruments including the tambor (a drum covered in calf and goatskin), the two-headed bombo, the marimba, a wooden flute called the quaita, a Spanish guitar and backing vocals. 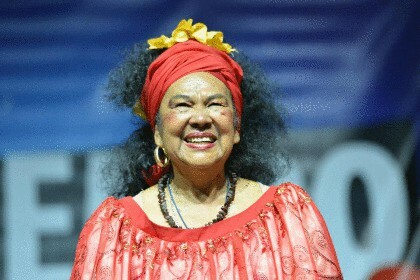 Momposina sang traditional songs from Colombia’s Caribbean coastal region dealing with the myths, beliefs and dreams of life in this part of the world. On Jan.8 and 9 in the magnificent Teatro Adolfo Mejia, Jordi Savall led the inaugural concert Cristobal Colon Paraisos Perdidos (Christopher Columbus:Lost Paradises) with La Capella Reial de Catalunya and Hesperia XXI (Andrew Lawrence King on harp), Manuel Forcano reading Hebrew, Arabic and Nahuati (Aztec) texts, and the master Moroccan oud player, Driss el Maloumi. The music was a journey through fifteenth-century Hesperia (Spain before the Conquest) during the time of Christopher Columbus when Muslims, Jews and Christians lived peacefully together. But sadly, lamented in the music and the accompanying texts, racial hatred and cruelty destroyed this potential Paradise. The final stroke was dealt in 1492 with the expulsion of the Jews, the conquest of the Moorish Kingdom of Granada by the Christian monarchs Ferdinand and Isabella, and the eventual forced violent conversion of the Moors in the Kingdom of Castille. The texts and music for this concert were masterfully chosen by Jordi Savall. The action begins with the Roman chant prophesy in Seneca’s Medea telling of the discovery of new lands beyond Ultima Thule, the end of the habitable world. The most moving moments in the musical journey, the heart-wrenching Moorish and Sephardic Andalusian songs of lament accompanied by Arabic texts (Travels of Ibn Battuta), occurred during the reign of Yusuf III (1408-17). The climax surely was the impassioned conquest of Granada, when the Moors were about to leave their beloved Paradise, the music accompanied by the Arabic poetry of Ibn Zamrak and a verse in the Nahuati language. The story then shifts to the New World where, with equal zeal, the native cultures of South and Central America (another Paradise) were being brutally subjugated and exterminated by Christopher Columbus and his followers. With the destruction of this second Paradise, we finally come to realize how necessary it is to achieve a dialogue and understanding between different religions and cultures. On the evening of January 9, Folias, Antiguas & Criollas (from the Old to the New World) was given amidst the hanging balcony flowers of the inner courtyard of the Convento Cerro de la Popa with its wonderful views of the old city. The early popular Hispanic “folia” dance taken from its Hispanic roots to the New World acquires a Latin veneer. 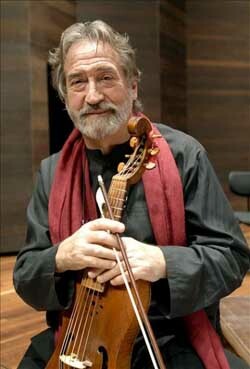 The early folias, antiguas and criollas were performed by Hesperion XXI on stage led by Jordi Savall on viola da gamba. Two members of the Mexican Tembembe Ensamble Continuo added some Latin American flavour to show what cross-fertilization between the Iberian original and the later Latin form can produce. On January 10, Jordi Savall presented a musical homage to the memory of the victims of the slave trade, Las Rutas de los Esclavos (1444-1888). Hesperion XXI, La Capella Reial de Catalunya, the Mexican Tembembe Ensamble Continuo with three Latin American singers from Brazil, Argentina and Venezuela, and three superb African musicians, Kasse Mady Diabate (Mali, vocals), Rajery (Madagascar,valiha) and Driss el Maloumi (Morocco, oud) took part in this journey. 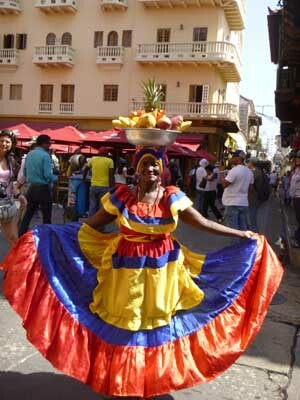 More than one million slaves passed through Cartagena, one of the main slave ports in South America. Since the Spanish crown forbad enslavement of indigenous people, plant owners looked to West Africa to fill their quotas. The homage is accompanied by historical texts on slavery, beginning with the early chronicles of 1444 and concluding with texts written by the Nobel Peace Prize winner Martin Luther King shortly before his assassination in 1968. The outstanding features of this superb memoir were again the selections of Jordi Savall and the accomplishment of the Mali contingent. 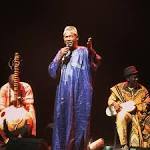 Foremost among the performers for me was the singing in Bambara, the dominant Malian language, of Kasse Mady Diabate, one of West Africa’s finest singers and a descendant of the most distinguished griot (troubadour) family of the ancient Manding Empire, the Diabates of Kela, the royals of Mali. Expressing himself almost completely through his music, Kasse Mady records all nuances of the human soul with his poignant song. Another great musician from Mali, Ballake Sissoko, played a variety of traditional and anonymous pieces from his homeland on the kora (a 21-string instrument somewhere between a lute and a guitar). 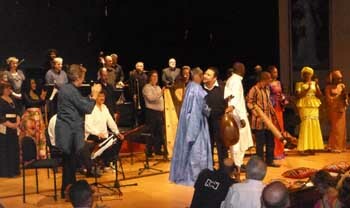 Rajery, the “Valiha Prince” of Madagascar, performed on his bamboo tubular harp-like instrument and Driss Maloumi (Morocco) on the oud. On January 11 Jordi Savall, La Capella Reial de Catalunya and Hesperia XXI presented Cachuas & Bayles del Codice “Trujillo del Peru”, Catedral de Lima, 1780-90, eleven songs and dances from the nine volumes of the Codex Trujillo, compiled by the Spanish bishop Baltasar Jaime Martinez Companon in 1767. With over 1400 water colour drawings and more than twenty musical pieces, it illustrates life in Peru during the final years of colonial rule. During the ten days of the Cartagena Music Festival a long list of historical and musical frescoes has thrown some light on our attitude towards “the Other,” whether Africa, Latin America or our own past. Much of the music we heard was based on reflections on lost opportunities for a genuine exchange. For, in the end, we are all alike yearning for survival, rule of peace, compassion and hope. Do we truly live upon the earth? Not forever on this earth, only a short time here.